Put a festive finishing touch on birthdays, anniversaries, graduations, and housewarmings with these free downloadable gift tags. To use, simply print the tags, punch out a hole, thread your favorite twine or ribbon, and get gifting. 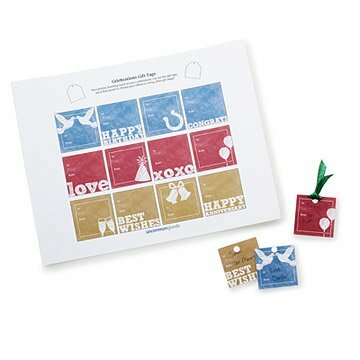 Click here for your free download of the Printable Celebration Gift Tags. PDFs formatted for 8.5" x 11" paper. Includes 12 unique designs and 12 tags per sheet. What a clever idea! I seldom feel comfortable downloading printables because the source can't be trusted and a download could contain malware. However, a pdf directly from the company is as trustworthy as can get, as far as I know. Cute labels. I downloaded all designs including the cheese plate labels that you wrap around a toothpick to make flags. Can't wait to you them! Thank you, Uncommon Goods!